Like I mentioned in part one of the 2014 Wide Receiver Rankings, the receiver position is extremely deep this year, and although I always want a stud like Demaryius, Calvin or AJ Green on my team, there’s a ton of talent to fill out the rest of your wide receivers. This group is chock full of young receivers in their first or second year who look primed for a breakout, and a few who could make a leap in to the top 20 as soon as next year. We’ll pick up with the Tight End rankings on Monday. If you missed any of the previous position rankings you can click here or on the 2014 Rankings link in the blue navigation bar above. 26. 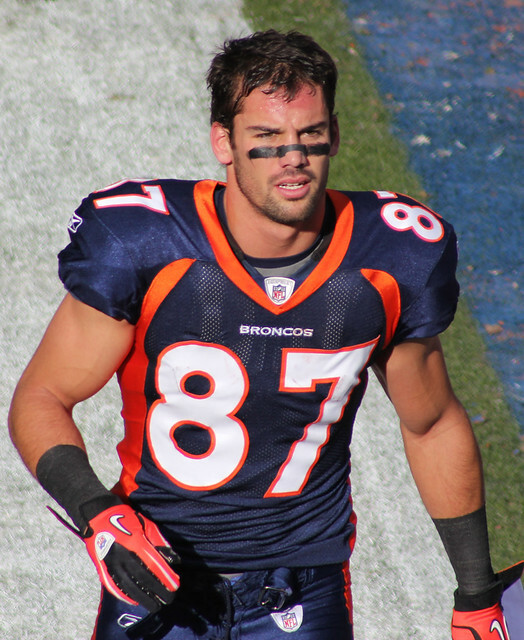 Eric Decker, New York Jets – Decker is a talented receiver with good size, great hands and a knack for getting open in the end zone, but in the fantasy world dropping from Peyton Manning to Geno Smith is like moving out of your 5,000 square foot Manhattan apartment and moving to Afghanistan. That said, I think there’s a better than 50/50 chance that Michael Vick starts the season as the Jets quarterback. Rex’s job is on the line and he’s not going down starting Geno Smith, at least not for more than a week or two. Decker is the Jets’ best weapon in the passing game and he should get a ton of targets. If Vick does start, Decker’s numbers could be a lot better than people think. With his mid 6th round ADP (29th amongst receivers) it appears that the market has already priced the change, so there’s a buying opportunity here, albeit a risky one. If your league mates overreact and he falls, draft him as a WR3 with upside, but obviously don’t expect the Manning inflated Denver numbers. 27. Emmanuel Sanders, Denver Broncos – In his years in Pittsburgh, Sanders was good, but not great with career highs of 67 catches, 740 yards and 6 touchdowns in his final year in the Steel City. Now moving to Denver for 2014, Sanders is primed for a breakout catching passes from Peyton Manning in the role vacated by Eric Decker. Sanders doesn’t have Decker’s size so I don’t expect a carbon copy of what Decker did, but if he can do 80% of what Decker did we’re talking 70 receptions, 1,000 yards and 8 touchdowns which would put him safely in to WR2 territory. Currently being drafted as the #39 receiver with an ADP of 104, he’s one of the better wide receiver values on draft day. 28. T.Y. Hilton, Indianapolis Colts – When Reggie Wayne went down in week 7, Hilton looked like a breakout star posting two straight 120+ yard games, but he followed that with 52 yards or less in 5 of his next 6 games. Hilton is a dangerous speed receiver who can explode at any time, but he’s a frustrating player to own in fantasy because of his boom or bust production. The Colts also have a very crowded receiving corps with Wayne, Hakeem Nicks, Da’Rick Rodgers and rookie Donte Montcrief so I’m not sure there’s enough targets to allow Hilton take the next step many are expecting. I’m a fan of Hilton and his talent but with his lack of consistency I’d rather have him as a WR3 but his 4th round ADP ensures that will never happen. 29. Kendall Wright, Tennessee Titans – Wright took a big step forward in 2013 posting his first 1,000-yard season on 94, catches but his fantasy numbers were suppressed after he found the end zone just twice last season. I like Wright as a player but there are a few factors that are keeping me from going all in on him. Last season Wright was a more productive receiver catching passes from Ryan Fitzpatrick than with Jake Locker, and Fitz is now under center in Houston. Add to that Locker’s extensive injury history and theres a chance Wright could be catching passes from rookie Zach Mettenberger by year-end. Wright is a good player but I expect his numbers to take a step backwards this season and his 5th round ADP is way too high for me. 30. Cecil Shorts, Jacksonville Jaguars – Following up a near 1,000-yard season, defenses keyed on Shorts in 2013 and his production dropped to just 777 yards before a groin injury forced him to miss the final three games of the year. The Jaguars offense should improve in 2014 (no kidding!) but he now has competition from rookies Marqise Lee and Allen Robinson, and catching passes from either Chad Henne or rookie Blake Bortles isn’t going to help his numbers either. Despite his talent, I see 1,000 yards as Shorts ceiling, which makes him a solid, but unspectacular WR3 in most scoring formats. 31. Marques Colston, New Orleans Saints – Once one of the league’s most underrated and reliable receivers, Colston dropped off dramatically in 2013 posting his worst yards and touchdown numbers since 2008. Battling through a variety of injuries last season, Colston was clearly not himself, but at age 31 it makes me wonder if his extensive injury history (and the dome turf) is catching up to him. Playing with Drew Brees in the high flying Saints offense will always make him fantasy relevant, but I would be weary of drafting him early based on what he has done in the past. At this point in his career Colston is best utilized as a WR3 in standard leagues but will probably be drafted earlier than that. 32. Terrance Williams, Dallas Cowboys – Williams had an impressive rookie year finishing third amongst rookie receivers in yards and touchdowns. With Miles Austin gone there is nothing blocking Williams from claiming the starting job opposite Dez Bryant, and he will see a lot of single coverage with defenses focusing on Dez and tight end Jason Witten. With linebacker Sean Lee out for the season, and a poor defense to start with, the Cowboys will find themselves in a ton of shootouts this year, which will lead to more targets for all Dallas pass catchers, including Williams. I’m looking for a second year breakout and his 8th round ADP looks like a great value. Draft him as a WR3 with WR2 upside. 33. Anquan Boldin, San Francisco 49ers – In a run first offense, with a struggling Colin Kaepernick under center, Boldin still posted an impressive 85 grabs, 1,100 yards and 7 touchdown season, yet is being drafted in the 11th round on average… talk about getting no respect. The return of Michael Crabtree and the arrival of Stevie Johnson will likely depress Boldin’s numbers but I don’t expect him to fall off the map either. There is talk of the 49ers passing more this season, and Boldin will be a big part of that (especially if Vernon Davis’ has a long holdout). Boldin was a high end WR2 last season, and even if he falls short of that he’s being drafted at a WR4 price so he’s a big time bargain in drafts. 34. Jeremy Maclin, Philadelphia Eagles – In 2013 Maclin looked prime for a breakout, but a second torn ACL ended his season before it started. Prior to the injury Maclin posted three straight seasons of around 900 yards and had a nose for the end zone catching 22 touchdowns in the three-year span from 2010-2012. Maclin is drawing rave reviews in off-season practices, but it’s far too early to be drawing conclusions about his health and ACL recoveries are tough. He is an ideal fit for the Chip Kelly offense, and could be in for a breakout season, but he needs to stay on the field first. Maclin is a high risk / high reward WR3 with good upside. If your league mates forget about him be ready to pounce. 35. Golden Tate, Detroit Lions – Leaving the Super Bowl champion Seahawks for the Lions in the off-season, Tate gets a big boost from his surroundings, moving from 26th best passing offense to the 3rd best. Tate is not physically dominating in any area, but he’s a smart player who knows how to get open and make plays. Playing opposite Calvin Johnson, he is guaranteed to see single coverage and should clean up underneath. Tate was a borderline fantasy starter in his days in Seattle, but he’s a good bet to set career highs in every category in the Motor City. He should be drafted as a WR3 with upside. 36. Mike Evans, Tampa Bay Buccaneers – At 6’5” 225lbs with surprising 4.5 speed, Evans projects to be a monster in the NFL for years to come. I’m a huge fan of Evans ability and have him rated as my #1 rookie receiver this year, but in redraft leagues fantasy owners should temper their expectations for Evans and all rookie receivers. Since 2007 the only rookie receivers to eclipse 1,000 yards receiving are AJ Green and Keenan Allen. While the yards might not be there I do expect Evans to contribute a lot in the red zone for the Bucs, and it wouldn’t surprise me to see him catch double-digit touchdowns, which gives him a good fantasy base to build on. Don’t go crazy on any rookie, but the talent is there so draft him as a high upside WR3 in redraft leagues. 37. Reggie Wayne, Indianapolis Colts – Coming off a 1,300-yard performance in 2012, Wayne was on pace for a repeat before a torn ACL ended his season after just 7 games. Knee injuries are very difficult and at 35 years old a recovery is far from a sure thing, but reports out of Indy are positive so far. The Colts brought in Hakeem Nicks and rookie Donte Montcrief this off-season, both to give Andrew Luck more weapons and as Wayne insurance, but now the team has a lot of mouths to feed. With their crowded receiver corps and their run first approach I question how much production Wayne will have even if he is on the field. Still, he’s a potential hall of famer, so it’s tough to rule him out completely. I would draft him as a WR3 if he falls, but don’t take him early on his name value. 38. DeAndre Hopkins, Houston Texans – Like Terrence Williams I’m looking for another step forward from Hopkins, but unlike Williams, Hopkins’ situation is far from ideal. The Texans will be starting Ryan Fitzpatrick under center, and with an incredible defensive line holding opponents in check, the team could opt to pound the rock, especially if they’re ahead. That said, if Andre Johnson holds out or gets traded Hopkins has a chance to become the focal point of this passing game, which should lead to a big boost in his overall numbers. Draft him as a WR3 with upside and hope Fitzpatrick does a better than expected job in Houston. 39. Sammy Watkins, Buffalo Bills – In the build up to the NFL draft, Watkins was ranked by many as the best receiver in the class, and while I prefer Evans, it’s easy to see why many experts like him with his game breaking speed, excellent quickness and ability to turn a two yard catch in to a long touchdown. That said being drafted by Buffalo didn’t do him any favors. While I think Watkins will be a pro-bowler for most of his career, quarterback EJ Manuel is very raw and I think he will hurt Watkins in the short term and as I mentioned with Evans, it’s tough to expect a lot from rookie receivers anyway. Watkins is a special talent and should be drafted very early in dynasty leagues, but in a redraft league his 5th round draft slot is far too high for me. If you can get a good value on him, draft him for upside, but I think his big breakout is a year or two away. 40. Julian Edelman, New England Patriots – It was a perfect storm of injuries and off-field issues that pushed Edelman in to the Patriots number one receiver role in 2013. He cashed in big catching 105 balls and looked like the second coming of Wes Welker. In 2014 the Patriots should have their full complement of weapons with Rob Gronkowski and Danny Amendola healthy (for now) and rookies Aaron Dobson and Kenbrell Thompkins with another year of experience. With that many mouths to feed and Belichick changing the offensive focus from week to week, expecting Edelman to have another year like he did in 2013 is foolish, yet fantasy owners are drafting him as if he will repeat. Unless the Pats suffer another rash of injuries (which is always possible) Edelman should return to being a borderline WR3 this season. 41. Riley Cooper, Philadelphia Eagles – Another product of the Chip Kelly offense, Cooper more than doubled his previous career highs in 2014. With Jeremy Maclin out last season and DeSean Jackson gone, Cooper is the most experienced receiver in the system, and clearly had a good rapport with quarterback Nick Foles with 742 of Cooper’s 835 yards coming after Foles took over in week 6. Cooper should continue to be a productive receiver as long as he starts (and keeps his mouth shut off the field). Draft him as a WR3, but as with everyone on the Philly offense, there is plenty of upside to be had. 42. Jordan Matthews, Philadelphia Eagles – A polished receiver right out of college, the SEC’s all time receiving yards leader was drafted by one of the league’s most explosive offenses, vaulting his fantasy stock up the board. Throughout these write-ups, I’ve mentioned a few times how rookie receivers don’t usually pan out, but the Chip Kelly offense throws logic out the window. Matthews is already taking first team reps in OTA’s and is drawing rave reviews so far. It’s still very early, and it’s hard to draw conclusions in late June, but I want a piece of that offense wherever I can get it. Matthews is an impressive talent in a great spot and for a 10th round pick I’ll draft that lottery ticket. 43. Brandin Cooks, New Orleans Saints – Another impressive college player drafted in to a great offense, Cooks was selected by the Saints in the late first round, and couldn’t have landed in a better spot for his skill set. In New Orleans he’ll likely take on the Darren Sproles role, lining up all over the field and creating mismatches with his 4.3 speed. The one knock in Cooks is at just 5’10” 186 lbs he’s not going to win many jump balls in the end zone, but the Saints are creative so they’ll find ways to get him the ball. As with any rookie, keep your expectations in check, but Cooks should contribute as a WR3 immediately, especially in PPR leagues. 44. Aaron Dobson, New England Patriots – At first glance Dobson’s 519 yards in his rookie season don’t look terribly impressive, but there were signs that Dobson could be a player primed for a second year breakout. He showed flashes what he could do, including a 130-yard, 2-touchdown game against the Steelers in week 9, but a foot injury limited him down the stretch and caused him to miss three games. The Patriots offense is notoriously complex, even for veterans, so another off-season to get comfortable could do him a lot of good. With his size and speed, he could give the Pats the vertical threat the team has been looking for since Randy Moss left. Draft him as a high upside bench player who could be poised for a breakout season in a good offense. 45. Hakeem Nicks, Indianapolis Colts – After an underwhelming, injury riddled, career in New York, Nicks signed a one-year deal with the Colts. A very talented receiver who has massive hands and plays bigger than his 6’1” frame, Nicks has trouble staying on the field and was clearly ‘checked out’ mentally last season. Andrew Luck is a big upgrade at quarterback over Eli Manning, which could boost his numbers (especially if Reggie Wayne isn’t ready to go) but as I’ve mentioned many times, the Colts would seemingly rather run than pass. Assuming he stays on the field Nicks should improve on the pathetic numbers he posted his last two seasons with the Giants, but it’s hard to draft him higher than a WR3 until he proves he can stay healthy and motivated. 46. Brian Hartline, Miami Dolphins – Nobody is excited to draft Hartline on their fantasy team, but let’s not forget that he was one of just 9 receivers with 1,000 or more receiving yards in each of the last two seasons. When you consider that there are at least 60 receivers drafted in a standard league, his level of production is hard to pass up with an ADP of just the 13th round. Don’t get me wrong, I’m not saying he should be a cornerstone player on your team, and his upside is certainly limited, but consistent 1,000-yard receivers don’t grow on trees. The Dolphins offense should be improved in 2014 and if Hartline can pick up a few more touchdowns, he’s certainly WR3 worthy and will cost virtually nothing. Hartline could be one of this year’s biggest draft day bargains. 47. Josh Gordon, Cleveland Browns – Unless you live in a cave (sorry GEICO Caveman), you know that Gordon was popped for another drug violation this off-season and is facing a suspension that could last the entire year. Add to this the news of a DUI arrest on July 4th AFTER he knew he was in trouble with the league. Most fantasy players are writing him off completely, and rightfully so BUT there is still a chance that Gordon’s suspension could only be 8 games (or less) so I’m ranking him here until the NFL tells us officially. In just 14 games last season Gordon amassed a league leading 1,646 yards and 9 scores, so if he does find a way to make it back at any point this year – even for a few games – he could be a difference maker like no other. You’ll obviously want to use a late round pick on him, but when we get to this point in the draft this amount of upside is worth a shot. When Gordon is on the field he’s one of the best (if not the best) receivers in the league and if he somehow skates on this suspension, a late round pick is a gamble worth taking. 48. Dwayne Bowe, Kansas City Chiefs – I’ve always had Bowe on my underachiever list, but coming in to 2013 many fantasy owners (including me) expected a resurgence from him in the Andy Reid offense. What we got was hot garbage, with his worst receptions and yardage totals since 2009 and just 5 touchdowns to go along with it… numbers that any number of waiver wire receivers could have put up for you. When he keeps his weight down and stays motivated there is still some room for upside with Bowe, and the “best shape of his life” pre-season rumors are starting, but unless he comes at a massive discount he won’t be finding his way on to my teams this season. 49. Kelvin Benjamin, Carolina Panthers – With virtually nothing ahead of him on the depth chart, Benjamin was drafted in to a golden opportunity to be the Panthers’ most productive receiver in 2014. Benjamin’s 6’5”, 240lb frame and long arms should create a lot of mismatches and allow him to bring down some jump balls in the end zone. He needs to improve his route running and concentration, which is something that plagued him in college. Benjamin looks impressive so far in camp, and reports have said that he will stay in Charlotte to work with Cam Newton in the off-season. The rookie hype warning still applies but if he can put it all together, Benjamin has as much upside as any rookie in this year’s class. 50. James Jones, Oakland Raiders – Although he set a career high in yards, Jones was a disappointment in fantasy, following up his 14 touchdown season with just 3 scores in 2013. Moving from Green Bay to Oakland in the off-season, Jones will suffer from the drop in quarterback from Aaron Rodgers to Matt Schaub but he should get a lot of work and could be a cheap source of touchdowns. With the Raiders’ roster full of middling talent at the receiver position, Jones should be the number one by default, which makes him fantasy relevant he is best suited as a bye week replacement, or deep league WR3 and will likely be on and off the waiver wire all season.